Locomotives of this class were introduced by the GWR in 1906 to work light branch passenger trains over the whole GWR system. In Wales they were particularly used on the lines from Shrewsbury to Aberystwyth & Pwllheli as well as the branch lines to Pembroke Dock & Cardigan. In all, 175 of these locomotives, designed by G. J. Churchwood were built at Swindon. No.5539 was one of the later locomotives of this class being built in July 1924. Most of its early years were spent in West Wales, & although it went to the West Country in the 1940's it returned to the Western Valleys in the mid 1950's before ending its days in Cornwall in April 1962. 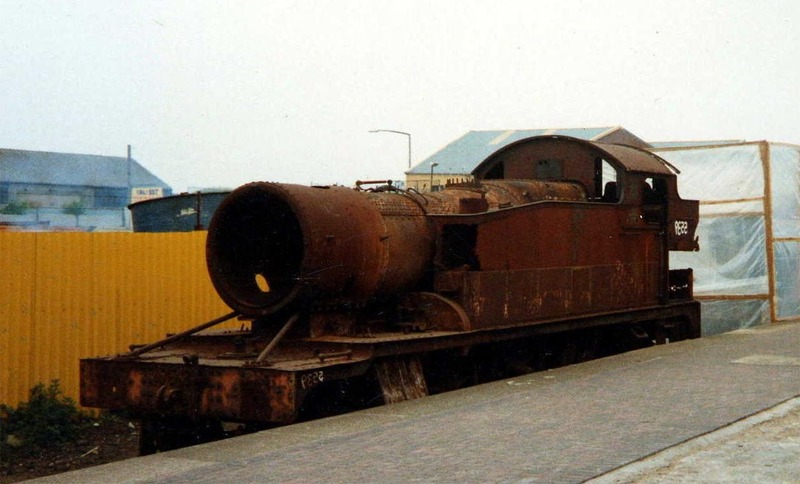 It was among the first locomotives to arrive at Barry Scrapyard. As an extension to the large Prairie tanks first produced in 1903, a prototype, number 115, with smaller dimensions was built in 1904 to work the hilly branch lines of the West Country & Wales. Equipped with driving wheels of 4 feet 1½ inches, a smaller boiler than the large prairie & cylinders of 17 inches diameter by 24 inches stroke, she was an immediate success & less than a year after its introduction, a further ten locomotives were ordered on a Swindon lot number but actually built at Wolverhampton. The class became numbers 3101 - 3110 for a short time until renumbered 4401 - 4410 with the prototype renumbered 4400. When additional locomotives were required, it was felt that the driving wheel diameter was rather small for any fast running & so limiting their use. Further orders utilised the larger 4 feet 7½ inch driving wheels giving the engines a far greater range. The first batch of 20 locomotives were built at Wolverhampton & numbered 2161 - 2180, whereas the next batch numbered 2181 - 2190, & all of the series built afterwards were produced at Swindon. Renumbered in December 1912 as 4500 - 4529, these engines were fitted with the square front framing while engines produced after number 4530 had the curved framing although, similar to the 2800 class, due to the low height of the running plate the curve was not as pronounced as other models. The 4500 series can be divided into two separate classes: the 4500 class consisting of 4500 - 4574 which had the flat topped tanks, & the 4575 class from 4575 to 4599 & 5500 to 5574 which were fitted with the increased capacity sloping topped tanks. 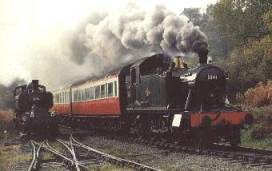 Number 4555 onwards were fitted with outside steam pipes & lengthened frames at the rear as standard. Some previous members of the class were also modified but not all. Again similar to the 2800 class, smokebox struts were used to support the front frame extension from 1909. The first withdrawal of the 4400 class was in December 1949 of number 4402 while three engines survived until September 1955. Of the 4500 class, the first withdrawal was of number 4531 in February 1950 & the last in service until September 1964 was number 4564. Regarding the 4575 class, first withdrawn was number 4586 in April 1956 & the last four locomotives of the class were withdrawn in December 1964. Three members of the 4500 class & eleven members of the 4575 class were saved from the cutters torch & they are numbers 4555, 4561, 4566, 4588, 5521, 5526, 5532, 5538, 5539, 5541, 5542, 5552, 5553 & 5572. Running numbers: 4400 - 4410, 4500 - 4599, 5500 - 5574. Built: 1904-6 (4400 - 4410), 1906-10 (4500 - 4529), 1913-15 (4530 - 4554), 1924 (4555 - 4574), 1927-29 (4575 - 4599, 5500 - 5574).